There is a free item at Smiths today. 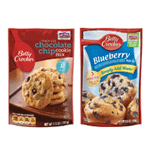 The free item is Betty Crocker cookies or muffins. Go to SMITHS and sign into your account to load the coupon on your store card. You have only today to load it to your card but you have until November 16th to redeem it in the store.